During a Level 1 Inspection, the chimney was discovered to have no cement crown and just window sill stones around the edges of the chimney top with mortar over rotten plywood. 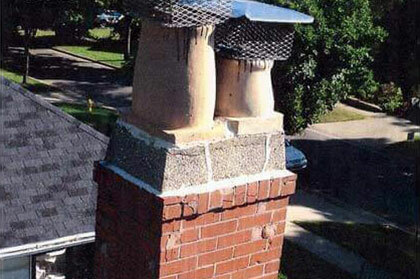 The tiles were falling apart and there were no chimney rain covers in place. with a ten year leaking problem, it was time to address the problem. 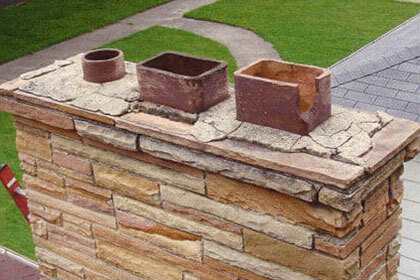 Valley Chimney was tasked to preserve the stone chimney and pour a cement crown. 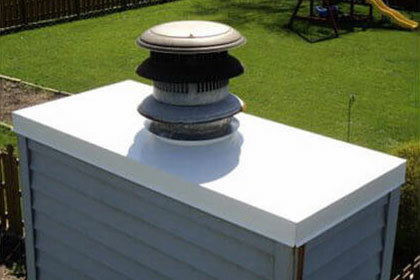 We also added upgrades to the chimney including the addition of a rain cover, chimney liner for orphaned water heater and removal of the crown dummy tiles. 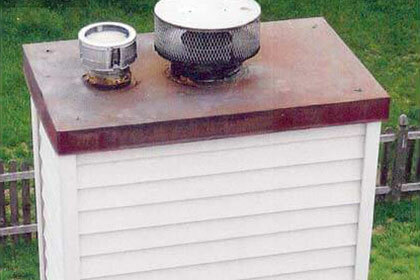 The homeowners were experiencing leaking inside their home from the chimney. They brought in Valley Chimney to inspect and advise. 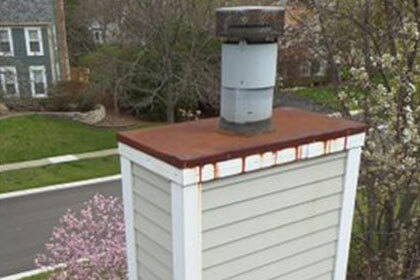 Valley Chimney advised that this is a very common occurrence, rust stains from the chase top leaking onto the chimney and siding. The solution was simple: install a new chase top. Problem solved! The Cherry Hills homeowners noticed staining on their new home siding caused from the thirty year old chase top. 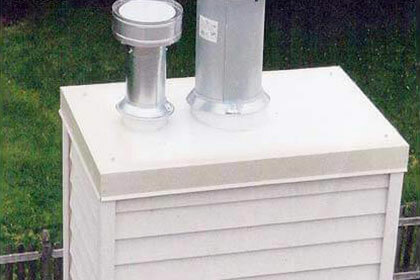 Valley Chimney came in and replaced the old rusty chase top with a new chase top termination, extended both of the chimney pipes and replaced the rain caps(raincovers) with the improved bird-proof models. 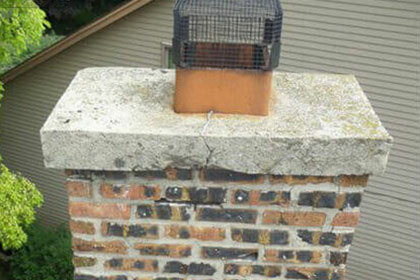 Our homeowner on the far east side of Aurora was experiencing issues with their fireplace. 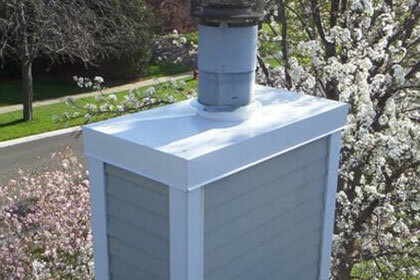 We started by extending the metal chimneys in the chase, then we replaced the chase cover with a new custom chase top with standing flue collars, storm collars and a new Bvent rain cover for the furnace flue. 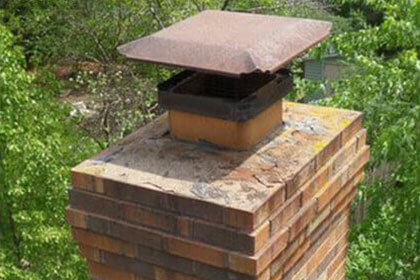 The homeowners were looking to fix their chimney and Valley Chimney came to the rescue. We relined the fireplace chimney completely because it had only been partially relined previously. 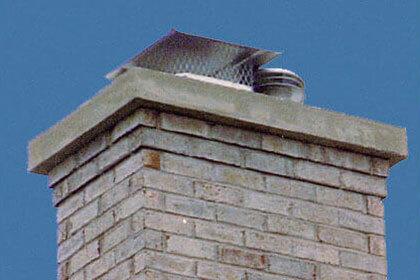 We rebuilt the chimney from the roof line, installed new flue tiles and capped off the blank flue. Finally, we poured a proper chimney crown to protect the chimney. 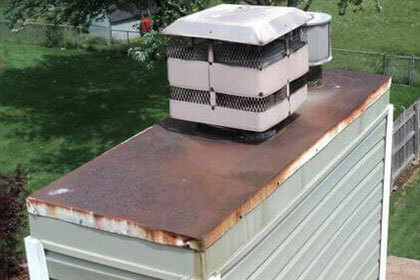 As you can see from the before photo of the chimney chase cover, there was a lot of rust on the cover which was starting to rust down onto the chimney. With the replacement chase cover and a paint job, this chimney now looks to be part of the chimney rather than a sore thumb on the roof. A Lisle, IL homeowner was experiencing water penetration due to construction short cuts. 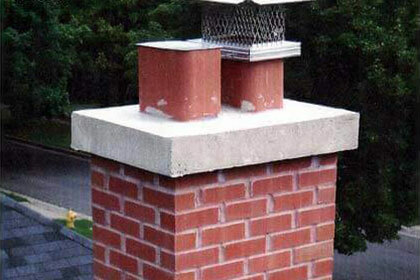 The original Klinker brick without core holes used on the chimney is more of a paver than a normal brick and therefore causing problems. The top cement was not reinforced and did not have expansion joints or a bond break. 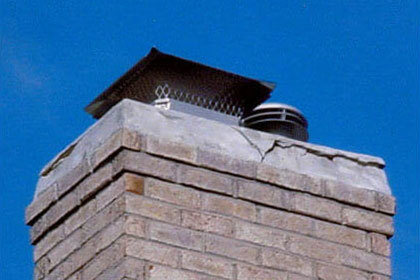 The old flue”looked” centered in the crown, but the top two flues were offset from each other leaving a 1″ gap for smoke and condensation to leak out. 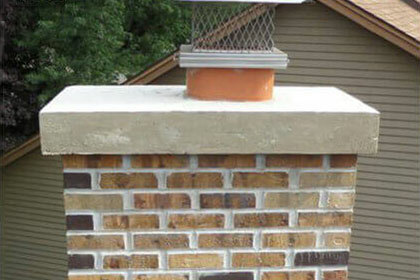 Valley Chimney’s restoration team rebuilt the chimney down to the flashing level, poured a stronger chimney crown and installed a chimney rain cover. 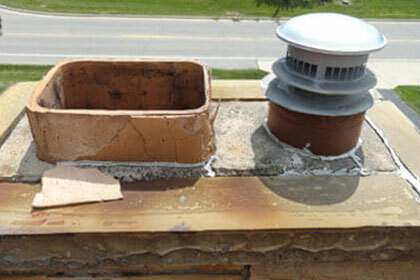 A Naperville, IL homeowner was experiencing water penetration due to a cracked chimney crown with no overhang. Valley Chimney’s restoration team put up some simple scaffolding and started the job by removing old mortar wash. We then formed and poured a new cement crown with reinforcing rebar, expansion joints and a bond break. 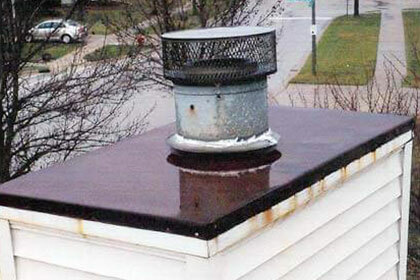 During a chimney inspection for a home buyer, we identified some issues that needed to be addressed: the chimney had no crown and the rain cover was rusting. 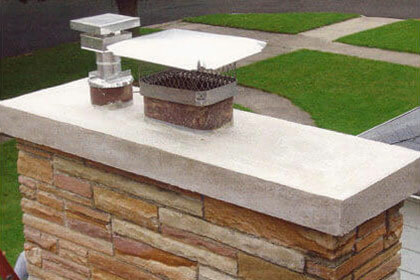 We were hired to form and pour a proper cement chimney crown. 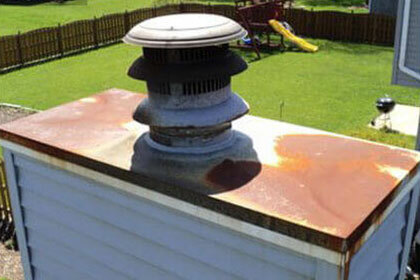 The chimney of this North Aurora home was rusting and leaking. Valley Chimney was called in to fix the problem. We installed a custom chase top replacement. As with all our chase tops, there is a cross break to help shed rain and snow off the top and avoid puddling. 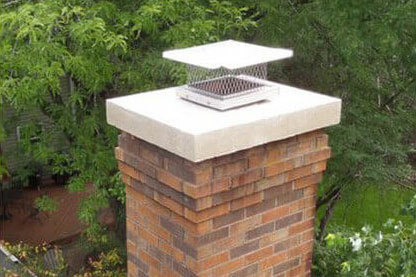 The new homeowners wanted to get their fireplace working again, however the former owners had used the unlined fireplace flue as a garbage incinerator, wreaking havoc inside and out of the chimney. Valley Chimney did a major relining project for the home. 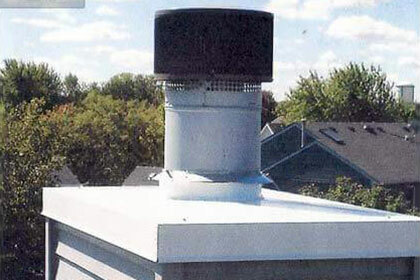 We replaced both flues with insulated stainless steel liners. The firebox was also rebuilt and a custom smoke chamber was remodeled for the upstairs fireplace. A wood burning insert was installed in the lower level fireplace to help heat the basement. 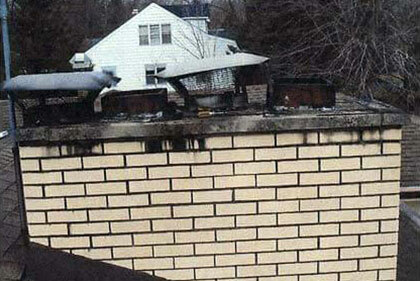 Affordable Roofing was hired to do a roofing job on Route 25 in Oswego. 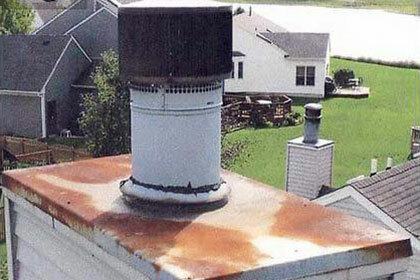 When they noticed the deterioration of the chimney and recommended that Valley Chimney come in before they started their work. 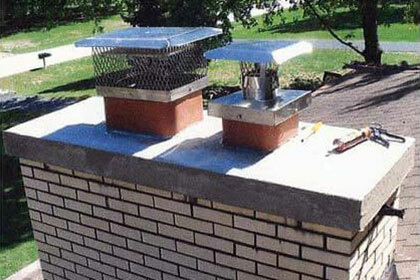 We replaced the large flue tile for the fireplace and poured a new cement chimney crown. No more window sill stones around the top, chimney is protected and no more leaking. 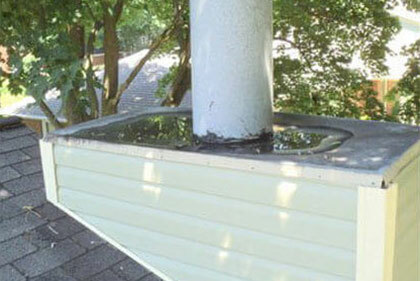 The homeowners had a roofer fix their recurring leak. Unfortunately, the fix was not done well and eventually failed. Valley Chimney came in and removed the rotten plywood and a gallon of tar. 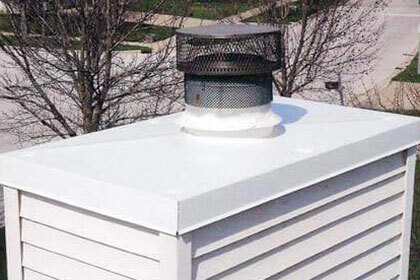 We installed a new non-combustible base with a spacer, then added a custom chase top with a standing flue collar and a new storm collar. 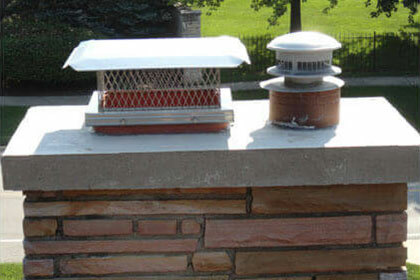 Homeowners in the Mallard Point area turned to Valley Chimney to replace their chimney chase top cover. 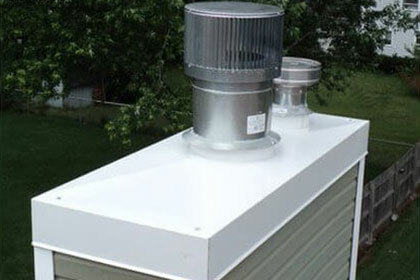 We replaced over 100 chase top covers in the Chicago area during this year. 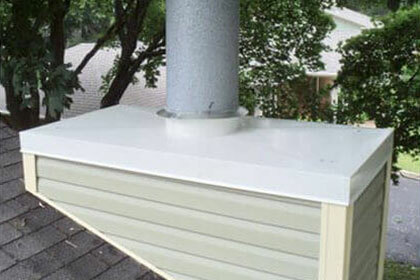 This chase top cover was custom and the home owners were happy with the results.